THIS POST HAS BEEN UPDATED FOR 2010, THE NEW POST CAN BE FOUND BY CLICKING HERE. Have you ever wondered what your property taxes would be if you lived in another township, or if you switched your homestead status to your non-primary home? 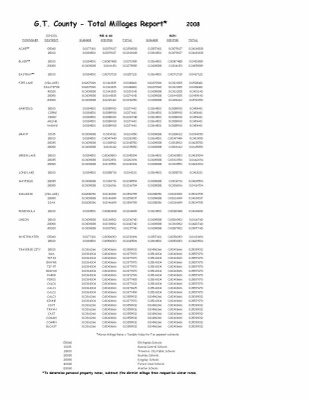 By clicking the photo below you can download a PDF chart of current Grand Traverse County property tax rates (post November 2008 election) along with a description of how to figure your own taxes. I hope this helps!